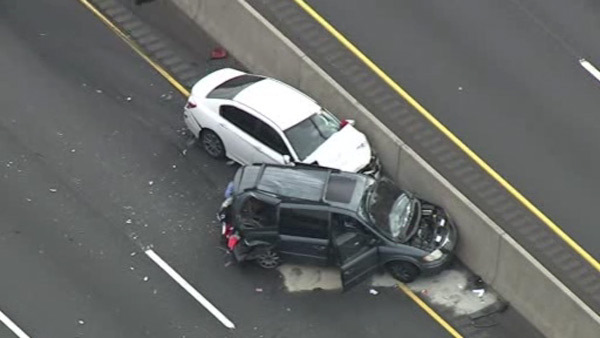 NORTHEAST PHILADELPHIA (WPVI) -- Philadelphia Police have identified the man killed in a chain-reaction crash in Northeast Philadelphia that left 2-year-old twin sisters seriously injured. Dennis Alexander, 27, from the 3300 block of Rand Street in Philadelphia, was standing in front a disabled minivan on Woodhaven Road Tuesday when it was struck from behind by a sedan. Police say Alexander sustained multiple head injuries and was found unconscious after the minivan surged forward and hit him. He succumbed to his injuries at an area hospital Wednesday morning. The crash occurred around 1 p.m. Tuesday on Woodhaven and Thornton roads. Police say a Subaru Impreza being driven by a 48-year-old man was struck by a Honda Accord. The 30-year-old male driver of the Accord then struck the rear of a Chrysler Town and Country minivan. The minivan was disabled on the left lane of Woodhaven Road with its hood up. Police say Alexander was standing in front of the vehicle pouring fluid in the radiator when the minivan was struck. The 28-year-old female driver of the Chrysler was transported to Aria-Jefferson Health's Torresdale facility for neck and back pain. Twin sisters in the back seat suffered serious injuries. One was unconscious and sustained head trauma. The other sister was conscious, but sustained a possible broken leg and other injuries. Both were transported to Aria, stabilized, then air lifted to St. Christopher's Hospital for Children. Police say they were both in child safety seats at the time of crash. The 30-year-old driver of the Accord told police he became distracted by something in his car, causing him to look down and when he looked back up, he was unable to stop in time. He attempted to swerve right, but hit the Impreza and then the minivan. He was taken to Hahnemann University Hospital where he was treated for a possible broken hip and leg. The 48-year-old driver of the Impreza was not injured. Police say there are no charges at this time as the investigation continues.